The following is a guest article from Debbie Dubrow of Delicious Baby. With Thanksgiving and the winter holidays just around the corner, it seems like everyone I know is heading out of town. When I talk to parents, the thing that causes the most stress isn’t holiday gifts or basting the turkey, it’s the prospect of a long plane flight or car ride with kids in tow. As a mom of two (ages three-and-a-half and two) who travels a lot with her two kids, I’ve learned and a few tricks that go a long way towards making travel days easier. If you have a very cautious child, consider visiting the airport in advance, or role-playing what will happen at the security checkpoint. Even very young toddlers are comforted by their parents explanations of how things work (even if they don’t understand all the details). Each extra ounce weighs heavily when you’re rushing through the airport with a crabby child, a stroller, and you’ve only got a few minutes to get to your airplane. Edit your suitcase, and ask yourself whether there’s a clever way you can do without each item you’ve packed. For example, would your child do just as well with a straw as a sippy cup? Can you order diapers online to be shipped to your destination? With airlines adding restrictions to carry-on bags and fees for checked bags, it’s worthwhile to check your airline’s website in advance so that there aren’t any unpleasant (and expensive) surprises at the airport. For more tips on packing light, check out our family packing lists. Kids create chaos, and when you’re trying to pack everything and everyone in the car, they have a way of undoing what you’re struggling to get done. If possible, hire a sitter to play with the kids while you pack up. If you’re flying, extra time at the airport will give your kids some time to stretch their legs before they get on the airplane. Bring some hearty snacks and pack them where they are easy to reach. We love protein-rich eggs and sunbutter sandwiches. Freeze dried fruits, crackers, cereal and cheese slices also travel well. Remember that any liquids need to be packed separately, so it’s easiest to avoid applesauce or other sauces. Here’s one tip we never forget: high-protein snacks and cow’s milk have a mild sedative effect on young kids. Avoid sugar – candy might keep the kids quiet for a few moments, but it works against you on a long flight. Takeoff and landing are hard on toddlers because they don’t know how to clear their ears. Bring a sippy cup or a straw so that your child can drink milk or water during takeoff and landing. Not every airline has milk on board, so buy some in the airport after you have cleared security, or bring some powdered formula from home. I look back longingly at the days when a long plane flight meant time to read, think, and relax. When I’m flying with the kids, I prepare to spend the entire time reading to them, playing with them, and attending to them. Now that we’ve all been on long flights together, the kids know that from the moment they get on the plane they’ll have my complete attention, and as a result they are well-behaved. (e.g. Where is Thumbkin?) and games before you leave home. Need more ideas? Check out our top ten tips for keeping a child busy on a plane and our list of ten great travel toys you already have at home. Don’t forget (or check) your child’s comfort object, whatever it might be. Travel is stressful. They’ll need it. If your child is sleepy, do everything you can to create a comforting, sleep-inducing environment. Give them a little milk to drink during takeoff. Follow the same sleepytime ritual you do at home, and sing quietly or play some music (using headphones). Here are more tips for helping your baby or child sleep on a plane. Debbie Dubrow is a mother of two (ages 3 1/2 and 2) living in Seattle. Her blog, DeliciousBaby.com, is about traveling with babies, toddlers and kids, and is filled with personal travel stories, family-friendly city guides, and lots of tips and advice for traveling with kids. Or in the case of the children being past binky age – bring the Loveys! If your child uses a blankie or a teddy, be sure to pack those items in the carryon bags. Nothing like a security item to get a child through the uncertainty of travel. We are leaving on a trip in just a few hours with an 18 month old and a 9 year old. I am nervous about traveling with our toddler but your post gave me some tips! Thank you for the timely post! Last month I traveled for the first time with my then 10 month old, and this post would have been a huge help! I actually figured out most of these on my own, and we had a pretty easy flight all things considered. It is so important to have something for them to drink during take-off/landing. My son had no problems with his ears but there were other small children on the plane who seemed pretty uncomfortable. Also, if you are a mom who breastfeeds and wants to do so on the plane, I recommend looking up the airlines policy on breastfeeding first. Some moms have actually been kicked off planes for refusing to stop nursing their child! And make sure you closely follow all those weird liquid rules and can get through security as quick as possible – that keeps your child from getting too irritated at, oh 4:30 in the morning. I loved this post. We have traveled all over Europe with my kids and (2 and 6) and have loved every minute of it. They have become great travelers and always ready for adventures. We try hard to make them part of the travel plans. If we have time before we read books about where we are going, if it is a new place and normally you can find a picture book or something about the things we might see on our travels. It makes it fun to play I Spy and keep a look out for certain things from the books we looked at. We also try and limit our stroller use, especially in the airport. We check the stroller early actually and then let the kids move around alot. Most airports seem to have space to walk around and explore a bit before having to get to our gate. The more we move the more they are ready to sit for the flight. Sunbutter! That’s so awesome. Thank you for not bringing peanut butter on an airplane. My son is highly allergic and it makes me so happy to hear people use Sunbutter. I think it’s extremely delicious! Lucie: Thank you for pointing out the breastfeeding issue. This is one of my personal pet peeves. Most airlines do not have a published breastfeeding policy, which means that you are on your own once you are onboard. To make matters worse, in the US there is no federal policy on breastfeeding, and the rules might be vastly different in your departure state than they are in your arrival state (and none of those laws govern while you are in the air as far as I know). Quinn: I couldn’t agree more. Traveling with the kids certainly isn’t as carefree as traveling without them, but with our busy home lives, it’s one of the best ways for us to reconnect, and we all get a lot out of every trip. There’s no better feeling than making a new discovery with my kids, and I’m always surprised at how many of our experiences we are able to bring back home and make a part of our daily lives. Debbie – I agree, the negative incidents are pretty rare, but it is annoying none the less that there are few guidelines when it comes to breastfeeding on a plane. I had no problems from flight attendants or anyone else when we flew, but I have heard a few horror stories. The blog “PHD in parenting” has a LOT of information on this, including a post that breaks down the policies of airlines. It was very helpful for me if anyone is interested, google the blog and it should pull up as one of the top articles. One more thing – Debbie, I just checked out your site and it is AMAZING and your children are seriously adorable (or, should I say, delicious?). Everyone should go check it out!!! What a great resource… I had looked for a list of policies like this & will add a link to it from my blog. Thanks so much for the pointer. Thank you so much for this post. We’ll be traveling in December with our 6-month-old and I’m looking for as many tips and suggestions as possible!! Or in the case of children being past Binky and Lovey age as in *teenagers* bring the ipod and cell phone with the chargers. I was lucky enough to get to fly with one of my grandchildren. We like to be some of the last people leaving (in other words, we don’t rush around, if possible, while traveling with kids.) I coached our grandson to thank the crew as we disembarked from the plane and they offered to let him sit in the cockpit! I got wonderful pictures that he has shared with pride over the years. Just thought I’d share as it’s possible your child can enjoy the same experience. I had no idea but it was a pleasant surprise and an unforgettable experience for him. A few more tips – normally I hate chewing gum, but I do have some in my “bag of tricks” for plane trips to offer an older child during take off and landing. Gameboys and/or puzzle books are helpful with an older child when you need a break. We found a picture version of Sudoku captivated him for nearly two hours during a long trip when he was 5 or 6. Bring your face paints and a package of wipes! It’s great fun on a long trip to go in as a tiger and come out as a zebra. What a terrific idea, I’ll have to try that on our next flight! I will be flying with a 2yr old and 5 mth old for christmas. thanks for the tips. These are all good tips (and your site looks great)! We definitely have learned some of these the hard way and others are new to me, so thank you! We do the “divide and conquer” except for check-in. Since they need to see the picture ID of every adult traveling, I didn’t think it would work for one parent to be off with the kids while checking in bags. Has it worked for you? I also started boarding last rather than first when flying alone with my toddler. I would walk him to sleep in the carrier and then board last to avoid all the commotion of others boarding waking him. Happy travels to all this holiday season! –from a fellow Seattle-ite, mama of two boys, ages 5 and 2. I’m so glad you liked my site. We check in online. That way we’re only checking bags at the airport. Because we tend to travel light, we can usually check everything under one person’s baggage allowance. When that doesn’t work, we’ll often show ID & then I take off with the kids while my husband checks everything in. One more point… Make sure everyone wears slip-on shoes! Nothing worse than having to tie all those little laces in security (ask me how I know)! My girls all wear their Crocs (with socks, of course – ewww!) when we fly. Easy-peasy! chinamama4´s last blog post…Happy Four-Year Gotcha Day, Abbie! These are all great tips. I think #1, #5, and #7 are my favorites. We recently had an airplane trip and my husband came up with an entire involved finger play outlining all the step of our trip. My son is still acting it out 2 weeks after we’ve returned. We did a lot of dividing and conquering, especially during delays. One of us would explore with our son while the other got a bit of a break. Also, I didn’t even bother to take my knitting. Not only did that save space, I wasn’t annoyed about not getting time to work on it. Oh my you are a bunch of brave people! I am afraid to even think of taking my one-year-old on a plane. Loved the tips though, will keep them in mind. Number 2 is a great idea! Oh, sorry – me again. Just thought I’d ask everyone here – what’s the longest flight you have ever taken your kids on and how did they cope? We live overseas, so when we travel back to the US for visits, it’s about a 20-25 hour flight time, including layovers. We’ve got an almost 4-year-old and an almost 1-year-old. It’s a looooong day. What you say is really encouraging me. We’ve got all the family living overseas and didn’t go to visit for more than 2 years. I couldn’t imagine going there with my lil’ one on a plane but you make it look achievable 🙂 Thanks Tsh! And by the way – LOVE your blog, always a source of inspiration to me. I’ve flown to Germany with an 18 month old. The longest flight was 9 hours one direction and 13 hours coming back. We did LOTS of taking turns walking up and down the aisles. I guess I’d call it doable but painful. 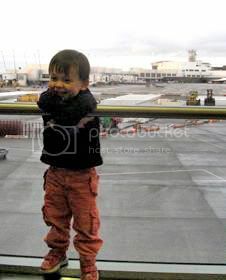 We flew to the Philippines when my son was 27 months old. We flew from Seattle to L.A. (2 1/2 hours); L.A. to Hong Kong (13 hours); and Hong Kong to Cebu (2 hours). It went much better than I could have imagined. We brought the car seat (and a little wheelie thing for it) and I do think that helped him sleep. We left Seattle at night so when we boarded the long flight, we did jammies, nurse and “night-night.” He slept for five hours in the seat and then was fitful and on me after that, but that was enough. We had a lot of books, very small and new-to-him items, the ergo carrier, and lots of snacks. Good luck with your travels!! These are great tips! Thank you…I enjoyed your blog. Michele Helms´s last blog post…Best cleaning tip ever. We have only taken domestic trips with our kids recently (ages 3 & 7). We take the easy way out. Activity books for take-off and landing, iPod loaded with movies and shows for the flight. Suckers/fruit snacks for ear-popping, although they can both chew gum now. When the baby was smaller, I would give her some baby tylenol before the flight to cut down on the ear pain. After the first screaming flight, we haven’t had the problem again. Thanks for the tips. I’ve linked you in my monday round up post.